Download your Paper Craft Template Models Online. These paper crafts are easy to do. That includes our Gundam papercrafts, Iron Man paper models, Transformers paper cosplay and many more. This paper craft model is for a ASW-G-08 Gundam Barbatos papercraft template. The ASW-G-08 Gundam Barbatos is the main mobile suit of the Mobile Suit Gundam IRON-BLOODED ORPHANS television series. The unit is primarily piloted by Mikazuki Augus. To give due credit, this papercraft model template is designed by gundam spicer. 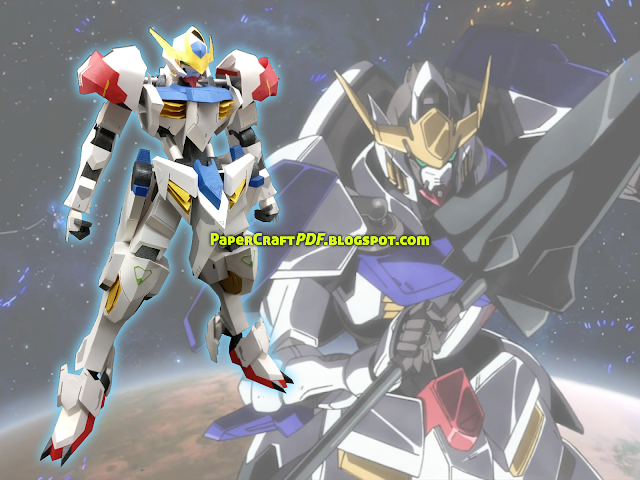 And this ASW-G-08 Gundam Barbatos papercraft model template is available in PDF versions with a few download links to choose from below. 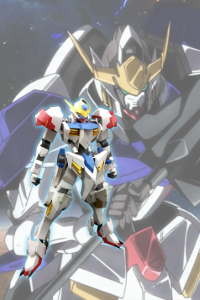 The Gundam Barbatos is the 8th of the 72 Gundam Frames created by Gjallarhorn near the end of the Calamity War to counter the threat of the powerful mobile armors such as Hashmal. It was later discovered by Maruba Arkay in the Mars desert and was recovered to serve as a power reactor for Chryse Guard Security's base. The machine was taken out of the base by Mikazuki Augus during Gjallarhorn's assault. CGS, now Tekkadan, continued to improve the suit with parts and armor taken from defeated Gjallarhorn mobile suits. Teiwaz technicians later restored the Barbatos to its original appearance and close to its original performance. Barbatos' spare parts were later used to transform the ASW-G-11 Gundam Gusion that Tekkadan had obtained from the space pirate Brewers into the ASW-G-11 Gundam Gusion Rebake. After the Montag Company offered their alliance to Tekkadan, the group gives them spare parts for Gundam Barbatos as a gift. Some of them were used for Barbatos' 5th Form, and 5th Form Ground-Type, and proved to be handy during the atmospheric entry battle and subsequent battles on Earth. During the battle against EB-AX2 Graze Ein, Mikazuki was pushed hard and in order to win, he sought more power from the Barbatos via his Alaya Vijnana system. The system responded to his request and improved his reaction speed, leading to Barbatos having better movements. The Barbatos' shoulder armor and backpack were later ejected as decoys, and the suit managed to slice off Graze Ein's forearms after Mikazuki mastered the Long Sword - the Barbatos' only handheld weapon left at that time. The Barbatos then won the battle after piercing Graze Ein's cockpit, killing Ein Dalton in the process. The Gundam Barbatos is one of 72 "Gundam" frames that was produced and used in the Calamity War, roughly 300 years ago. After it was recovered, Chryse Guard Security used it as a power reactor; aside from the fact that its Ahab Reactors were still functional, this was done mainly because Barbatos' cockpit was missing when it was found. A new cockpit similar to the one used by the CGS mobile workers was installed prior to its redeployment by the 3rd Group. Poor maintenance over the centuries since the Calamity War has degraded the Barbatos' armor and full combat potential. This is later rectified by Teiwaz technicians, who not only restored the Barbatos to its original look but also returned it back to a performance close to its original. Gundam units like the Barbatos are able to achieve a high energy output because they possess two Ahab Reactors. However because it is difficult to run them in parallel operation, only a total of 72 Gundam frames were ever produced. The burden experienced by the pilot is high as a result of the high output and maneuverability; however it's mitigated by the implementation of Inertial Control due to the use of Ahab Particles generated from the reactor when a phase transition occurs inside its vacuum device. The cockpit structure is positioned in front of the reactor to take advantage of this. Among the same frame machines, Barbatos has been adjusted for an emphasis on versatility, it has the potential to adapt to every circumstances by exchanging its equipment. It can also use weapons and armor from defeated enemies to improve its fighting capabilities. You may see the list of papercraft templates that we have here in this blog by clicking here : ► PAPERCRAFT LIST. If there are any paper craft model templates that you want but cannot find here, just comment your request below or go to our Request Page. I am a lowly paper craft model hobbyist. And this is my way of sharing my hobby and my passion to everyone in the same room. You can download all the papercraft model templates that I have here. Feel free to share this blog to your friends. Enjoy! Wanna know the latest papercraft model template updates, subscribe from to blog directly via email.